Students at AHS are participating in a work-based learning program at Starretts. The student you see here is Brenton Crocket. He is currently on his welding rotation and these are some of the items he has built. 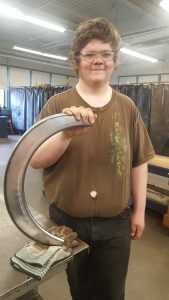 He absolutely loves this rotation and has decided that welding is what he wants to pursue for his career.